4. 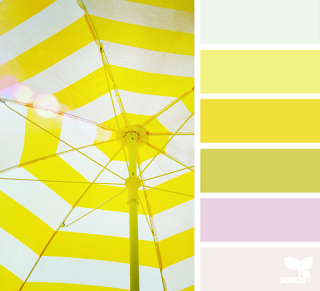 Substrate - Glossy Card. Here is what I made using the content of my travel bag. 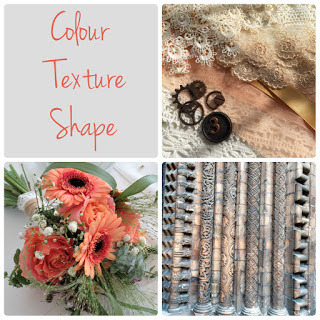 Please check out my tutorial over at A Vintage Journey to see how I put this together! Stamps: Mini Bouquet - Tim Holtz/Stampers Anonymous, A Little Garden and It was the Sweetest - Stampotique. Paper: Gloss Paper - Ranger, Kraft Core Cordinations. Accessories: Ranger Distress Stains Picket Fence, Wilted Violet and Twisted Cintron, Tiny Houses Die - Tim Holtz/Alterations, Flower Garden and Mini Bouquet Framelit dies - Tim Holtz, Grass strip die - MFT, Bird Punch - Martha Stewart, Tiny Twinkles - Taylored Expressions, mini sander - Ranger, water mister, Idea-ology Small Talk Stickers, Clippings Stickers, Layers/Botanicals, Paper Dolls, Quote Chips, foam dots, Tombow Glue, slice of birch tree, Black Stabilo pencil, Black Embossing Powder, edge distresser. 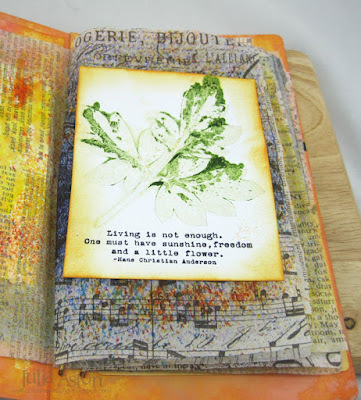 Today I'm joining in with the Papertrey Ink Blog hop. This is the beautiful inspiration photo for the hop. I focused on the bottom right sheet or paper with the wreath at the top. All of the stamps I used are from the Wreath for All Seasons Set. The dotted frame was made with one of the dies from the Mix & Mat Herringbone die set and the wreath is stamped on a piece die cut with the Layerz Mat Stack 3 die. 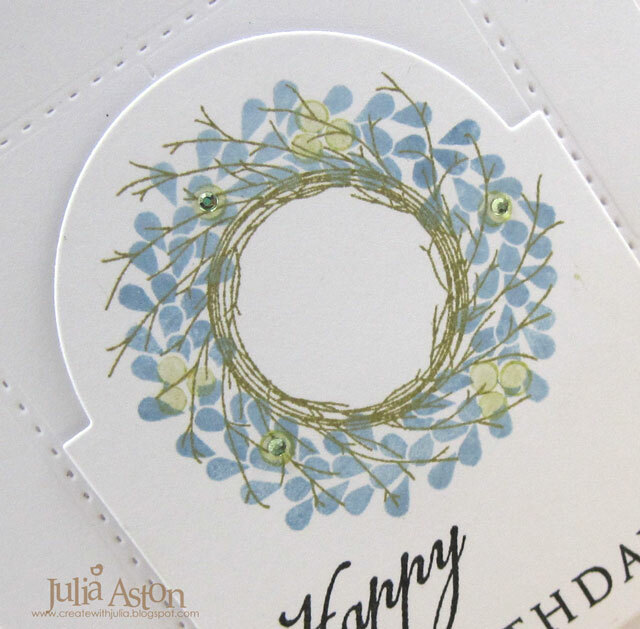 I used Prairie Grass ink for the wreath, Spring Rain for the leaves on the wreath and Spring Moss for the berries. 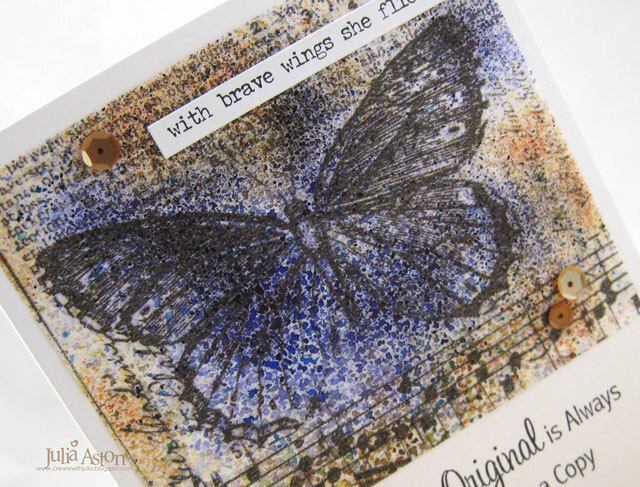 I added Tiny Twinkles on the single berry spots and stamped the sentiment in True Black. Are you playing along with the PTI hop today? 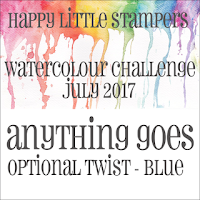 I can't wait to see how everyone was inspired! 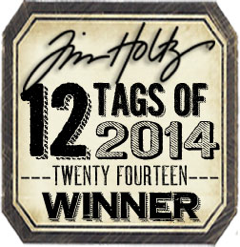 You'll find the hop on Nicole's blog here. 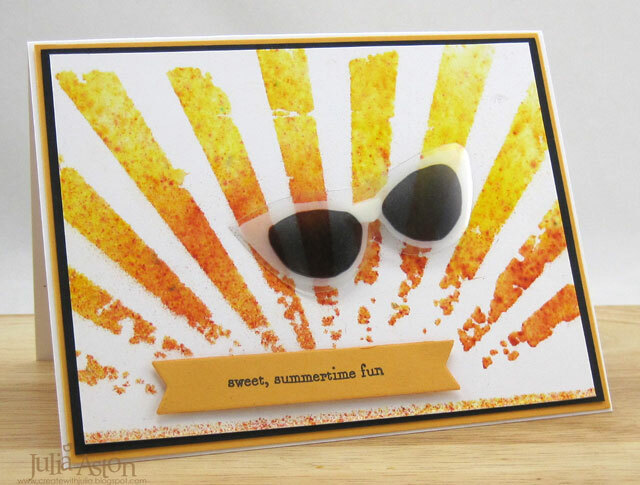 Accessories: Dies: Layerz Mat Stack 3, Mix and Mat Herringbone Die - PTI, Tiny Twinkles - Taylored Expressions, Glue Pen, foam dots. 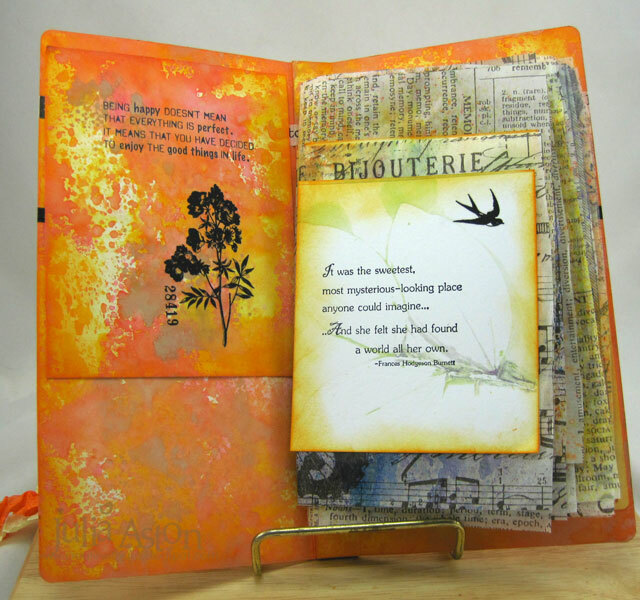 Have you seen all of the wonderful journals using Eileen Hull's Sizzix Journal die over on Eileen's blog this month? 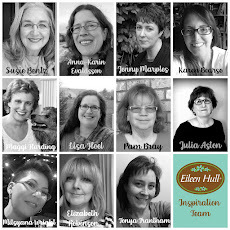 The Inspiration Team has been on overdrive! And today I'm sharing mine. And if you'd like to see "how" there are lots of photos to come! I die cut the journal out of Cream Little Sizzles Matboard using Eileen Hull's Sizzix Journal die. 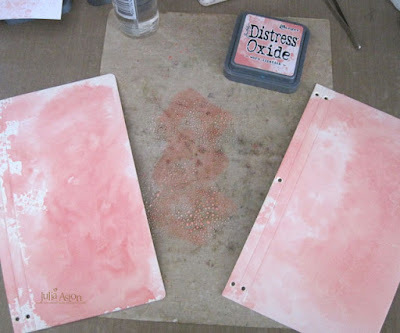 Then I started inking the sides by rubbing Distress Oxide Inks onto my craft mat, spritzing with water and then dragging the journal pieces through it. The first color was Worn Lipstick. The third color was Fossilized Amber. 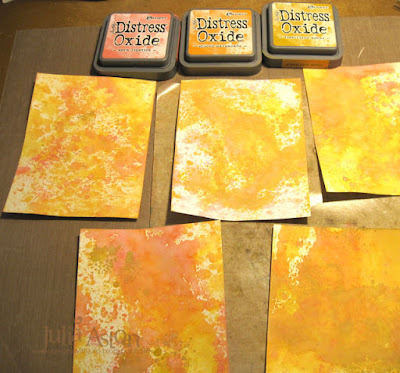 I inked all sides using the same mix of colors. I also inked some white card at the same time wiping up left overs on the mat figuring I might use some on my inside pages. 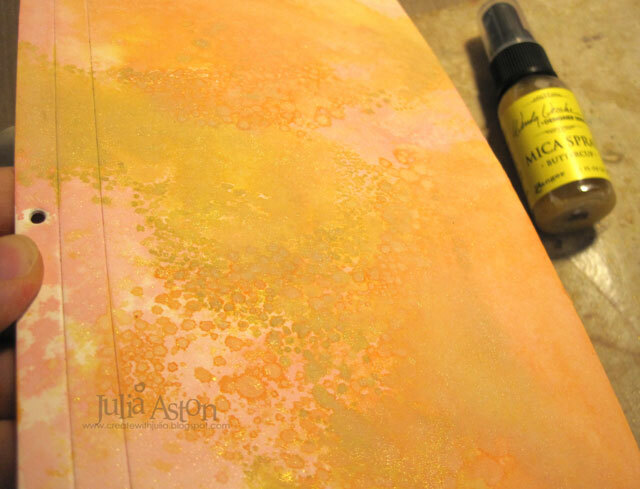 I assembled my journal gluing the two edges together being sure the holes lined up. I looped 2 pieces of gold elastic cord through the top and bottom holes knotting them on the outside. These will hold the pages inside the journal. I pushed two pieces of wrinkled seam tape, folded in half, through the middle hole, knotting it inside. These will be used to tie the journal shut. Here's the knot of ribbon in the center between the two signatures. Now to choose what kind of pages I wanted inside my journal. I decided to use some of Tim's Tissue Wrap in varying sizes. 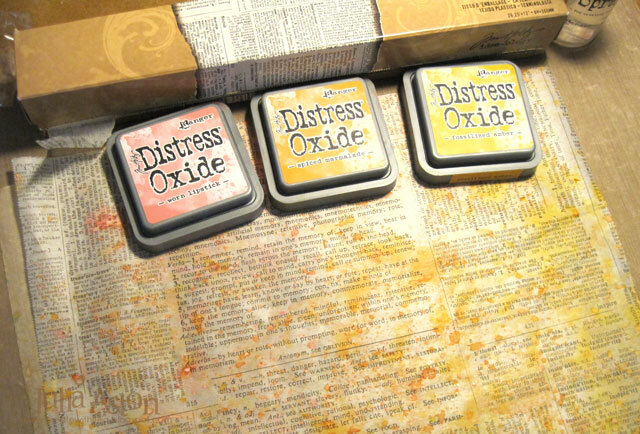 I colored some Tissue Wrap Terminology using the same Distress Oxides I used on my covers. 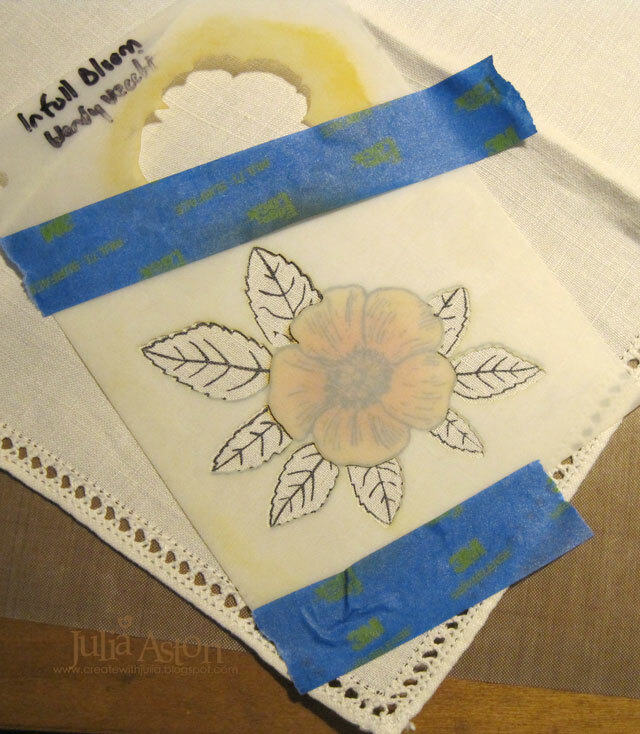 And I used Brushos in Ultramarine and Orange to color some Tissue Wrap Melange. 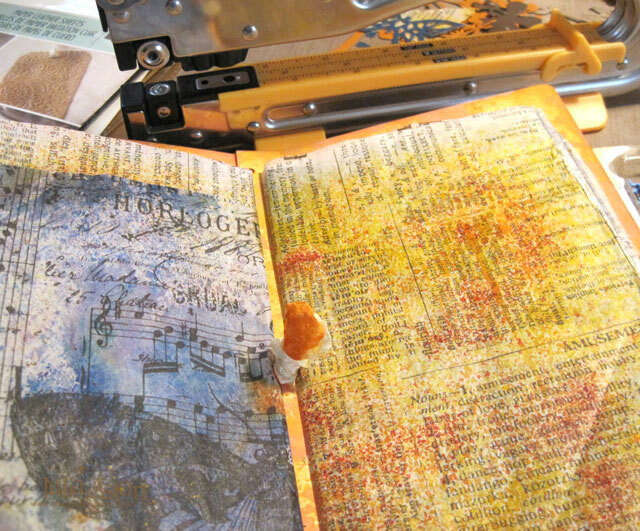 I started by cutting the pages 7 1/2" wide by 9 1/4" tall - I cut some to 7 1/2" x 5 1/4" as I like to mix the size of papers in my journals. I got out some more of Eileen's Sizzix Dies to use in decorating my journal and it's pages. I cut flowers using Stitchy Flowers and Leaf, butterflies from Birds and Butterflies out of Kraft Core Cordinations, made some pockets using House/Pocket Stitchlets cut from white Paper Leather from Sizzix, and cut the word SUNSHINE on one envelope using Word Stitchlets. I colored around the SUNSHINE cut-out using Distress Crayons in Scattered Straw and Shabby Shutters. Then I turned my attention to the cover. 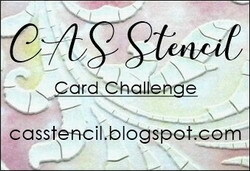 I stamped this lovely There is a Garden stamp from Stampotique onto a piece of Sticky Back Canvas. 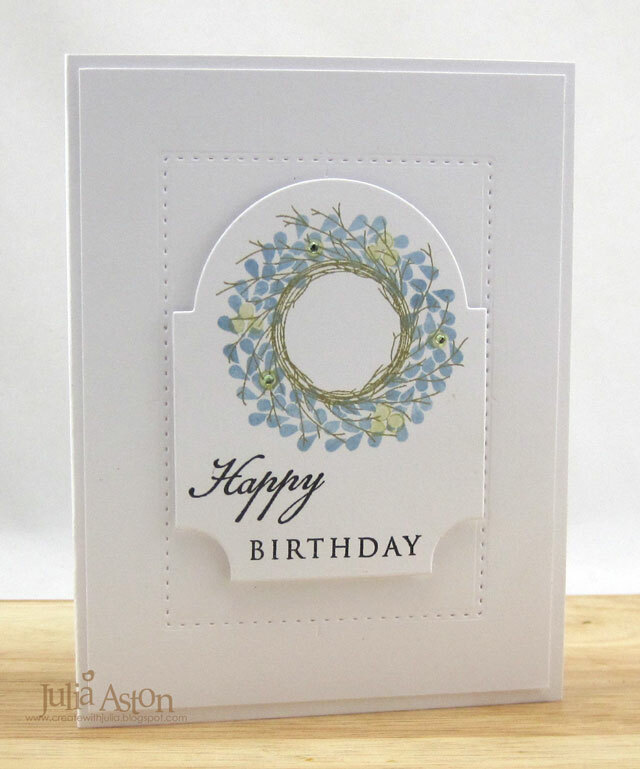 Then I die cut it along with a piece of Terminology Tissue Wrap using Tim's Arch Frame. 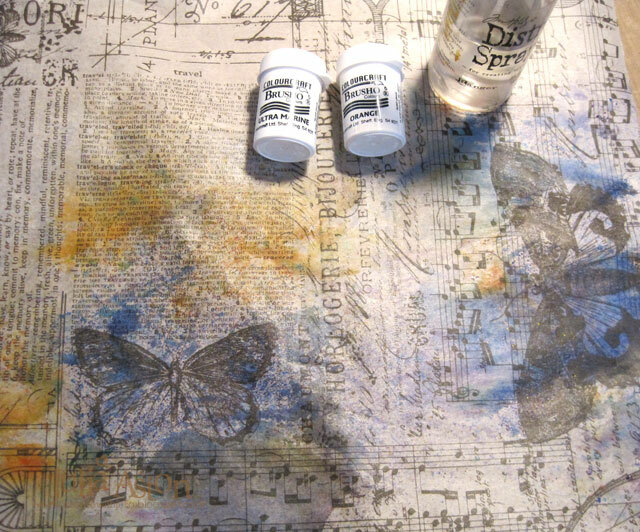 I adhered the sentiment to the tissue and the tissue to the cover. I had cut all the flowers out of Kraft Core Cordinations paper - so I sanded each piece a little bit being careful not to tear the petals. I layered several sizes and colors of petals together, joined them with an orange brad and layered them onto the cover using foam dots. 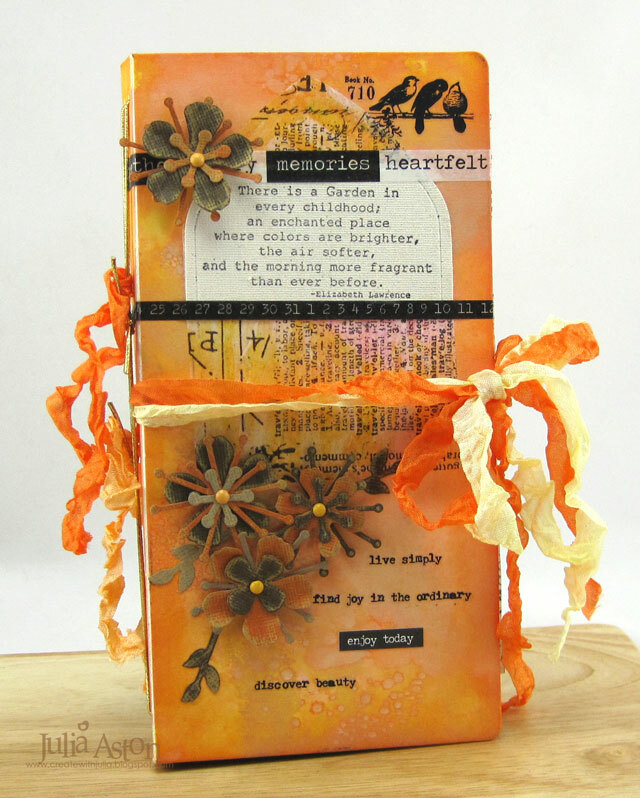 I also added some Botanicals Remnant Rubs, Design Tape, and Small Talk/Occasions stickers - all from Idea-ology. Then I started adding things to my pages. 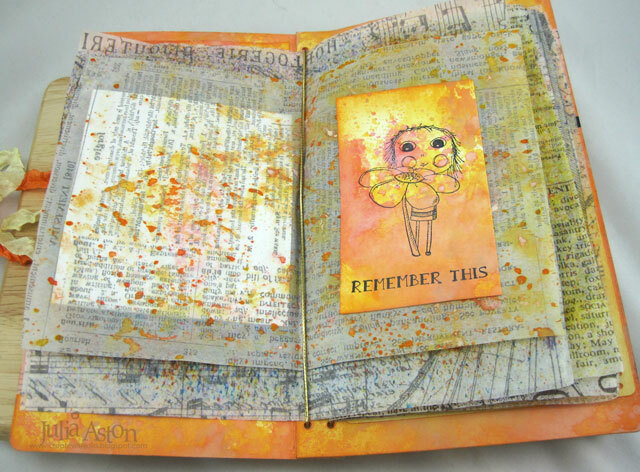 The Being Happy stamp on the inside cover is from Wendy Vecchi's Forever Art set, the flower is a Botanical Remnant Rub. Fold the copy paper in half. Build the following sandwich: cutting plate, paper towel, folded copy paper (open), piece of cardstock, plant. Place a second piece of cardstock on top of the plant. 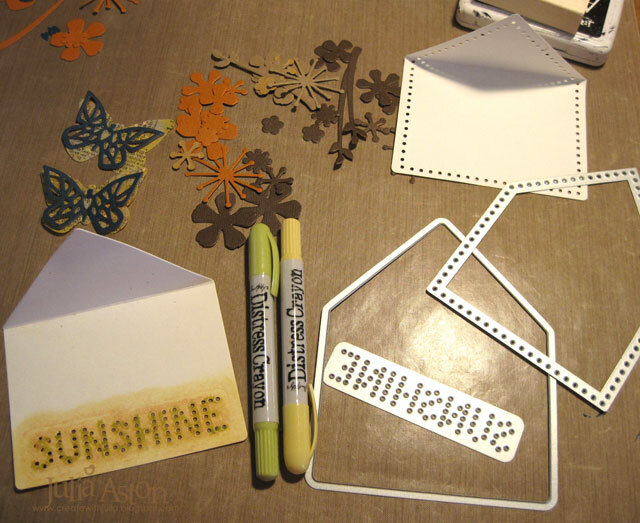 Close the folded copy paper (so the cardstock pieces and plant are inside the copy paper like a book), and place second cutting plate on top. 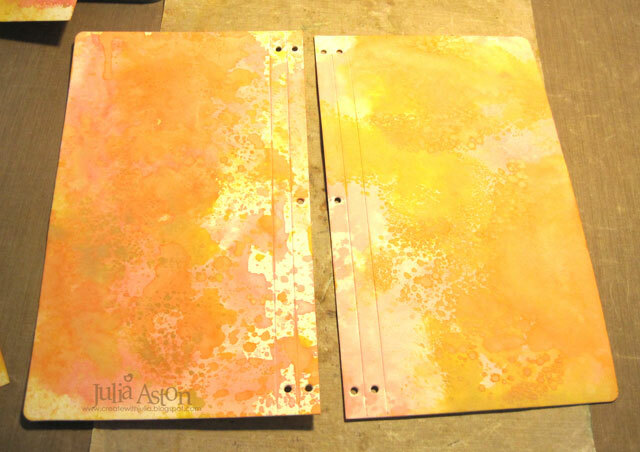 Run through die cutting machine on the normal setting you use for thin steel dies. I stamped over the plant print with a stamp from Stampotique and added a bird Remnant Rub. 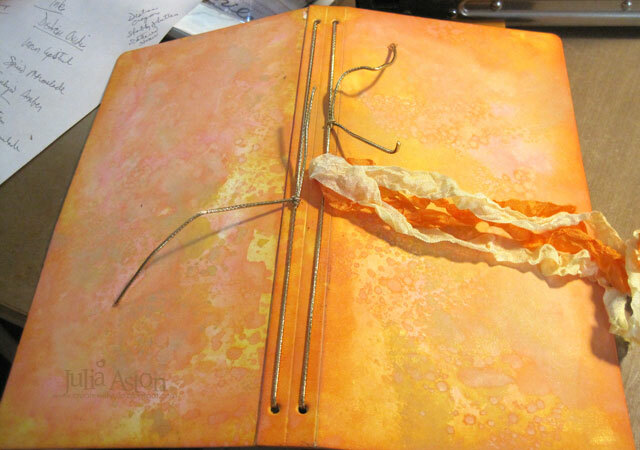 I sponged the edges of the panel with Distress Spiced Marmalade and adhered it to the page with double sided tape. 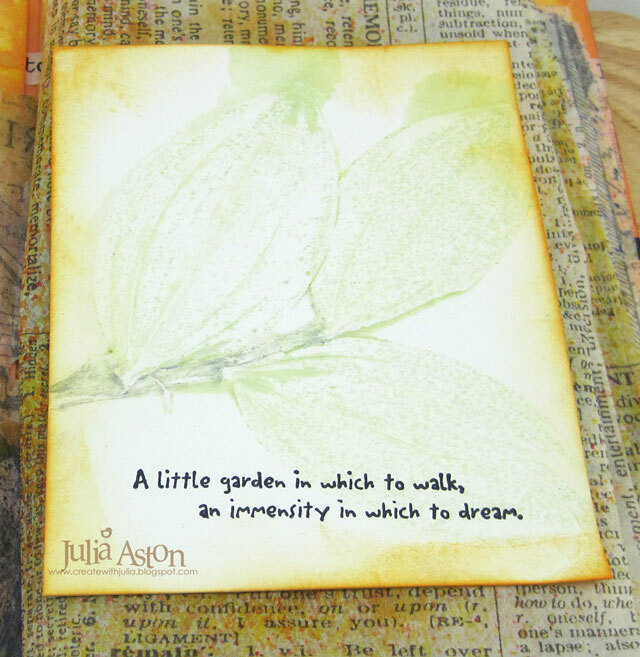 Here's a close up of the 2nd print I got from these Solomon's Seal leaves that I used on another page of my journal with A Little Garden stamp from Stampotique. 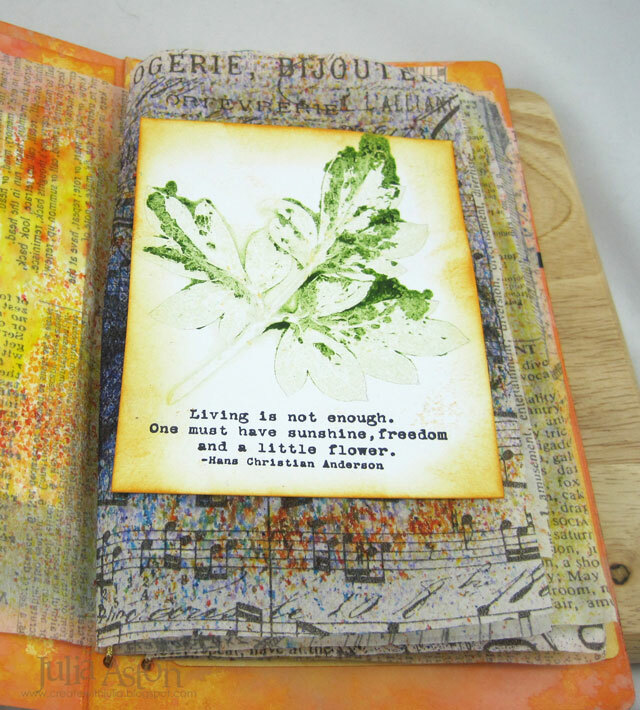 Another page - this is a leaf from my Bleeding Heart plant and Living is not Enough stamp from Stampotique. 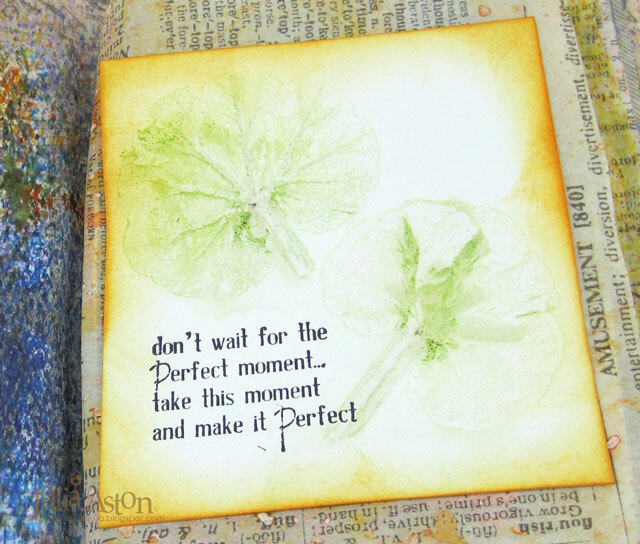 and a sentiment stamp from Wendy Vecchi's Forever Art set. 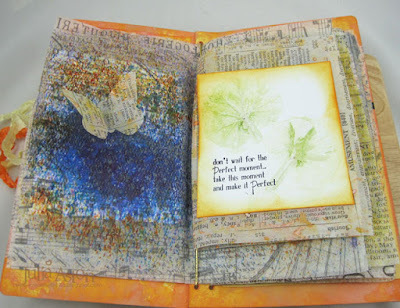 I die cut a butterfly from the Tissue wrap with Eileen's Birds and Butterflies die set adhering it on the left page. A close up of the geranium leaves. 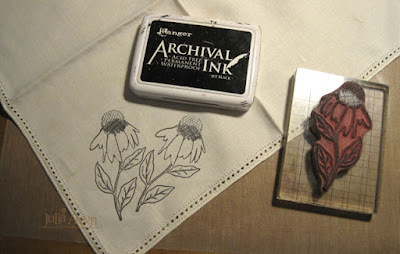 I stamped this sweet Agatha Flower stamp from Stampotique onto one of the panels I inked when making my covers. 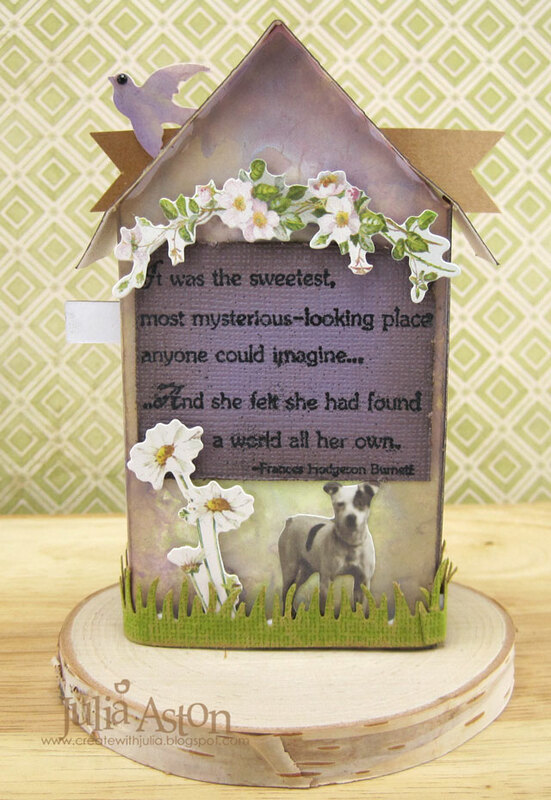 The sentiment is from Wendy Vecchi's Trademark Art set. I used the pockets I made with Eileen's House/Pocket Stitchlits die on two pages. 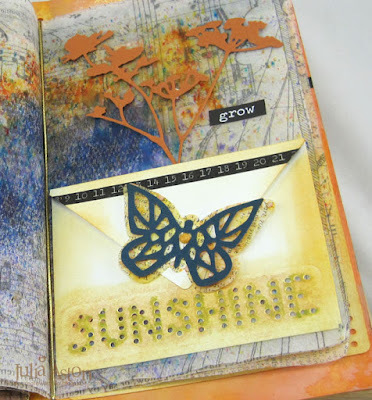 On this one I added a die cut layered butterfly from Birds and Butterflies, attaching it to the envelope with an orange brad. 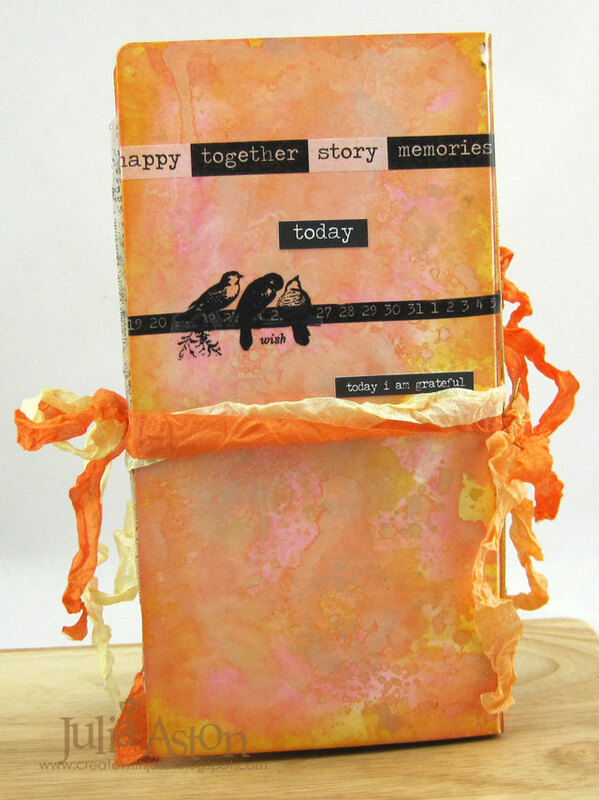 I used a strip of Idea-ology Design tape across the top and sponged the edges with Distress Spiced Marmalade ink. I adhered it to the page with double sided tape. 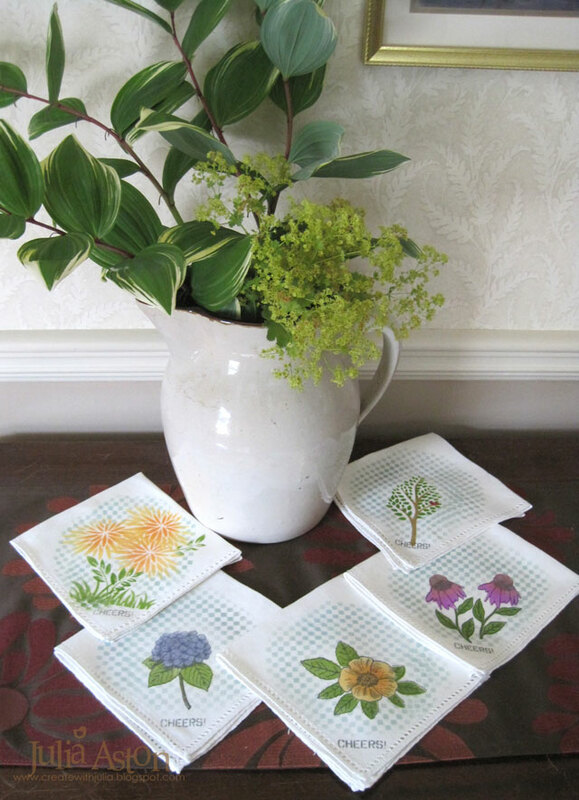 I die cut 2 wildflowers using Tim's Wildflower dies and inserted them into the envelope adding a Big Chat sticker beside them. 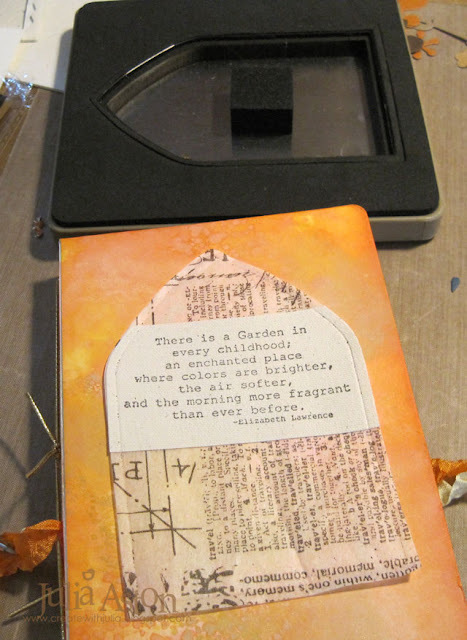 I put another die cut pocket on the inside of the back cover inserting some feathers found around my bird feeder into the top of the envelope. 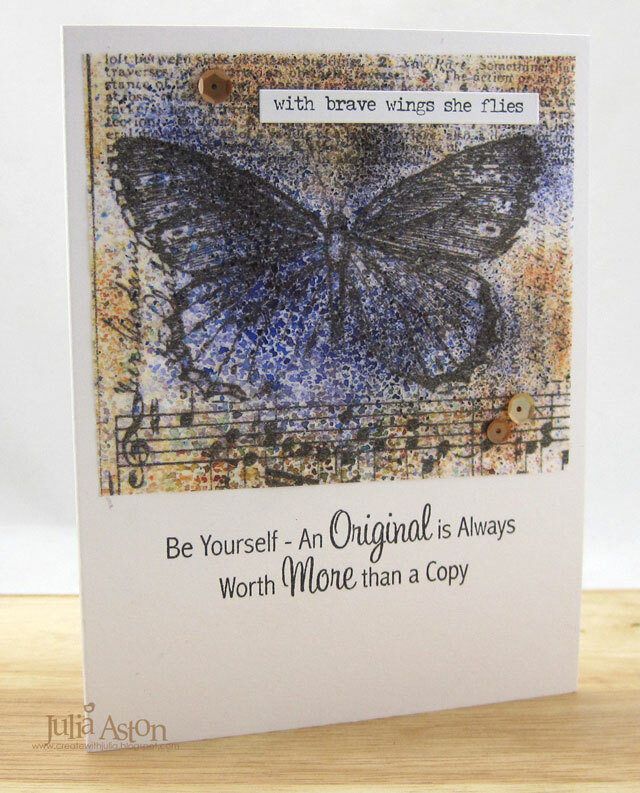 I added a Clippings sticker (if they were let to fly away) and Small Talk Occasions sticker (nature's wonder) as well as a die cut butterfly. I hope I have inspired you to try creating your own journal! (and not put you to sleep with all my photos!) I appreciate any and all comments left here! 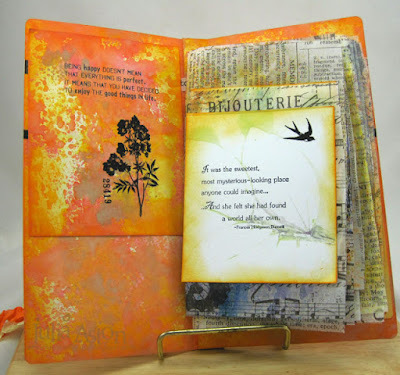 Remember to check out Eileen's blog to see all of the July posts about Journals using her wonderful new die! Happy Journaling! 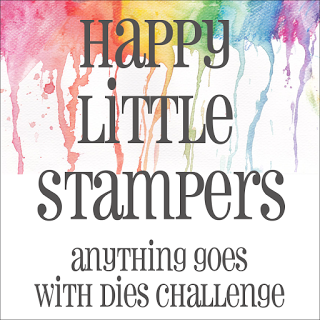 Stamps: There is a Garden, Living is not enough, Girl with flower, A little garden - Stampotique, Being Happy and Don't Wait from Forever Art set, Remeber This from Trademark Art Set - Wendy Vecchi Studio 490. Paper: Cream Little Sizzles Matboard - Sizzix, White Paper Leather - Sizzix, Kraft Core Coredinations, Natural Sticky back Canvas - Ranger. Ink: Ranger Distress Oxides Worn Lipstick, Spiced Marmalade, Fossilized Amber, Ranger Distress Ink Spiced Marmalade, Archival Jet Black. Accessories: Eileen Hull/Sizzix Journal Die, House/Pocket Stitchlets, Stitchy Flowers and Leaf, Word Stitchlits, Birds and Butterflies; Tim Holtz/Alterations Arch Frame, Wild flowers die; Distress Crayons Shabby Shutters and Scattered Straw - Ranger, Idea-ology Tissue Wrap Melange and Terminology, Remnant Rubs/Botanicals, Design Tape, Small Talk/Occasions, Big Chat, Clippings Sticker, Brushos Orange and Ultramarine, gold elastic cord - Michaels, Mica Spray Butercup - Wendy Vecchi/Ranger, foam dots, wrinkled seam tape, double sided tape, Gel Medium - Ranger, Mini sander - Ranger. For my card today, I used stamping, tissue paper, Small Talk Stickers and sequins. I started with a piece of Tissue Wrap/Melange from Tim Holtz. 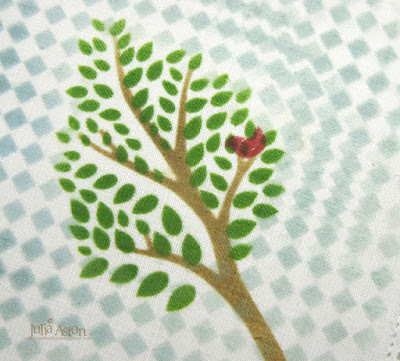 The design is already printed on the tissue. I cut a piece with the design I wanted and taped the edges to hold it flat on my work table. I sprinkle just a little bit of Brushos over the paper - Ultra Marine over the butterfly and Orange on the areas around the butterfly. Then I spritzed just a little water over it - just enough to make the Brushos react. I dried the piece with my heat tool and then cut it to 3 7/8" x 3 1/4" size. 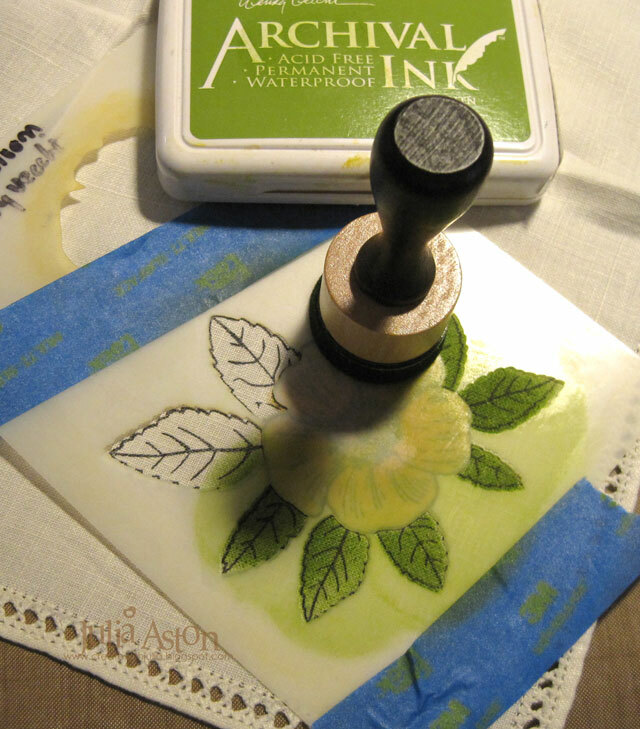 I adhered the tissue to the top of my card base using my tape runner. I added a Small Talk sticker and sequins, stamping the sentiment below the panel. Here you can see all the different bits of colors in each Brusho - especially the orange - if you spritz the Brushos with more water it just turns into watercolor paint and you lose the details of the colors. The stamped sentiment is from the Clearly Sentimental About Art set from MFT. 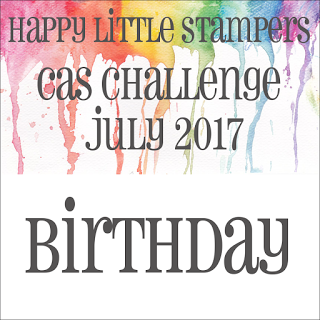 I added a birthday sentiment inside as I always need birthday cards, but I could have left it blank to use as an encouragement card. 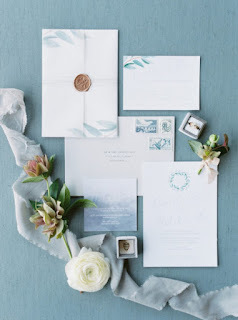 You'll find links to videos on ways to use Tissue Paper, the linky for your creations, as well as some pretty awesome inspiration for the Design Team here. 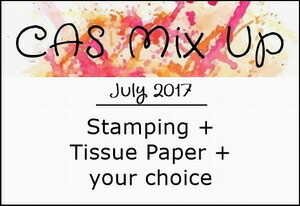 You have until July 24th to show us how you use tissue/stamps/and a media of your choice! 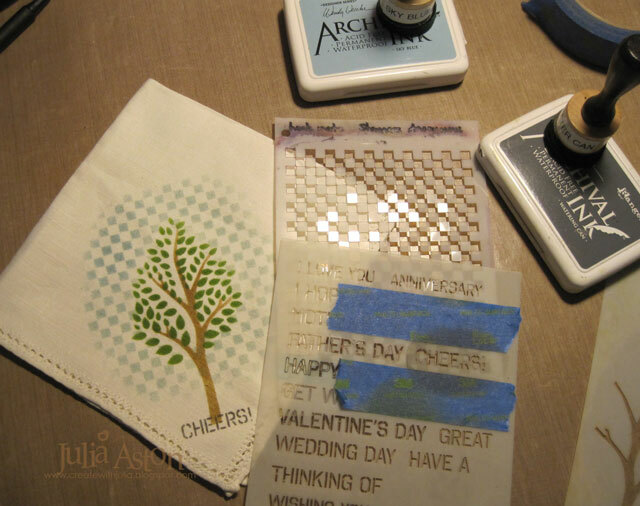 Accessories: Brushos, water mister, Small Talk Stickers - Idea-ology, Kraft Blend Sequins - Avery Elle. The July Challenge is up over at A Vintage Journey! 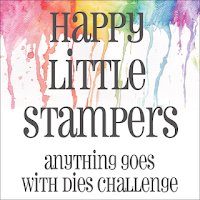 Tracy is our hostess this month and her challenge is "All Squared Up". Here is the challenge description in her own words: "Whether a frame, embellishment, die cuts, drawn squares, doodles or windows, let's see where inspiration takes you, let's get all squared up and show how creative those right angles can look! 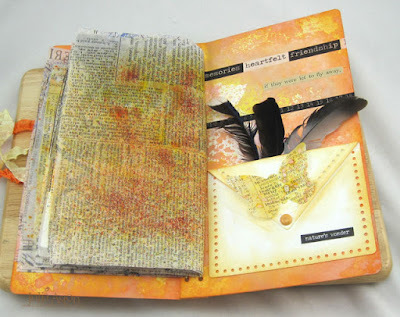 Show us your squared up pieces in a vintage; shabby; mixed media; art journaling; industrial, timeworn or steampunk style." I had a completely different idea in my head when I walked into my craft room to start my project - but as I started looking through my 'stuff' I found these wonderful vintage linen napkins that I purchased many years ago at an antique shop in Vermont (6 for $10.00!) and they were just waiting for me to pull them out and do something with them! 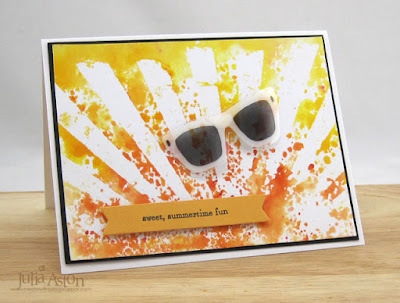 And stenciling is what I did to them! Wendy Vecchi has a wonderful tutorial on the Ranger blog here - from last December, showing how she stenciled on hand towels for Christmas. 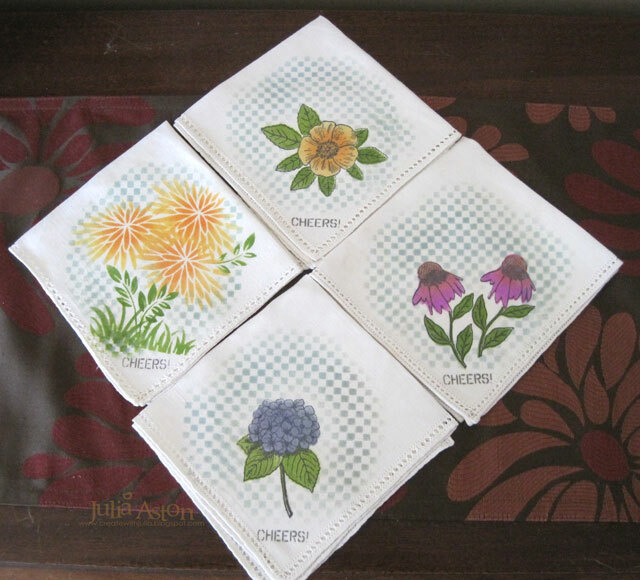 So my 'squares' are the square napkins as well as the Checkmate Stencil background on each napkin. I stamped a tiny red bird on the tree - but the clarity of the outline got blurred with the colors behind it but I like the little punch of color and you can see it's a bird when you look up close!! 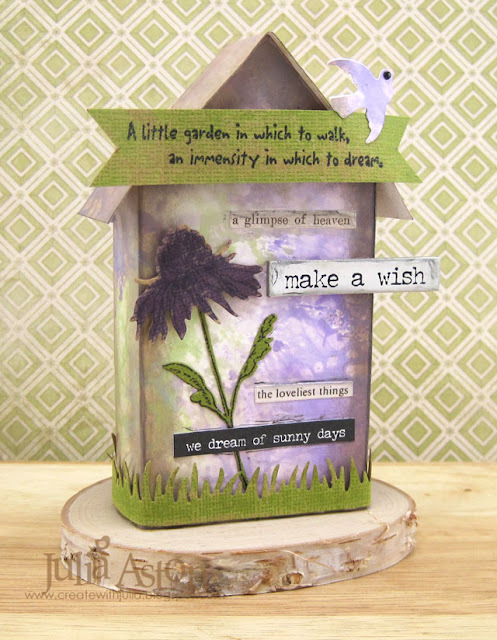 All the stencils, stamps (accept for the little bird) and inks are by Wendy Vecchi. 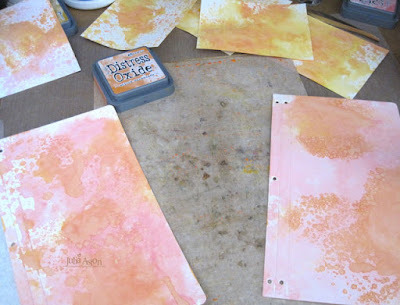 Here are a several photos of my process. 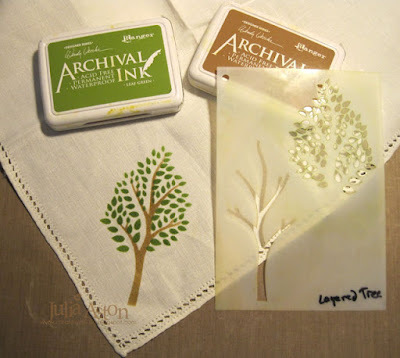 This stencil is Layered Tree - first I stenciled the tree trunk using WV Archival Tree Branch. 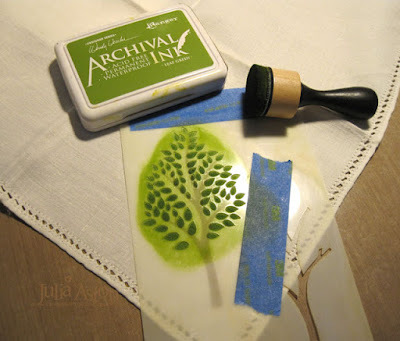 Then I moved the stencil to the leaf piece, lined it up over the stenciled trunk and sponged with WV Archival Leaf Green. 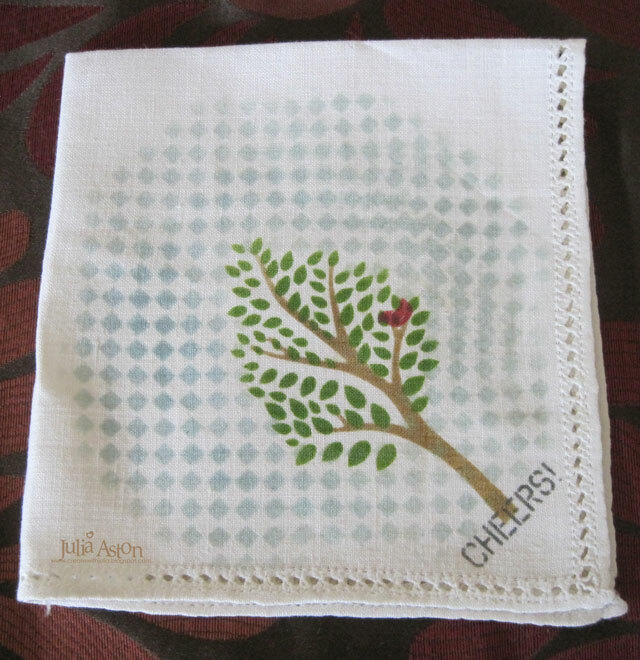 I wanted to have something that would unify the linen napkins since I used different images on each one - so I stenciled the same sentiment on each napkin using Wendy's Sentiments Stencil and WV Archival Watering Can Ink. 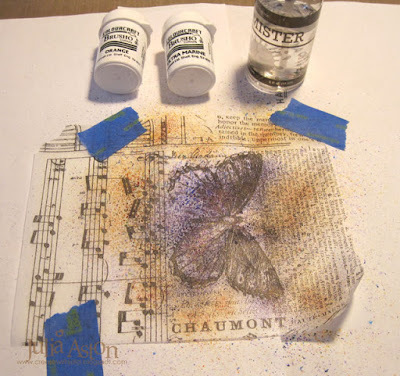 I also stenciled Wendy's Check Mate Stencil around each image using WV Archival Sky Blue ink. For the next napkin, I used another Stamp It Stencil It set called In Full Bloom - stamping the image and then stenciling with Tiger Lily and Sun Flower. 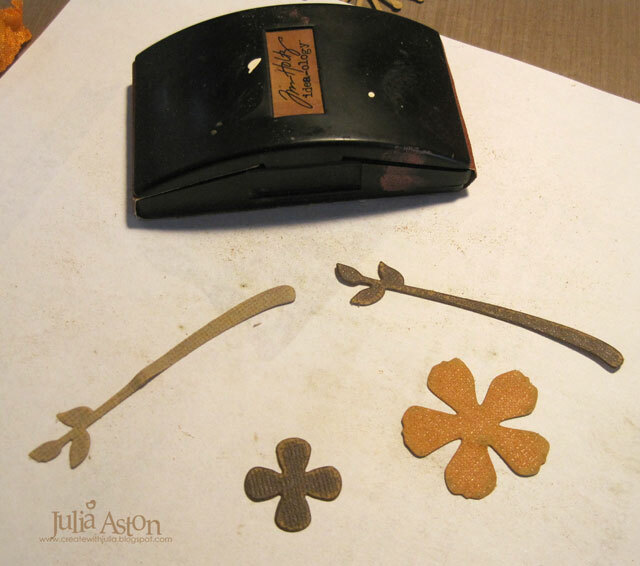 Here you can see how the stencil masks the flower and lines up with the stamped leaves so you can color each section separately. I'm not sure how well the colors will stand up to washing. 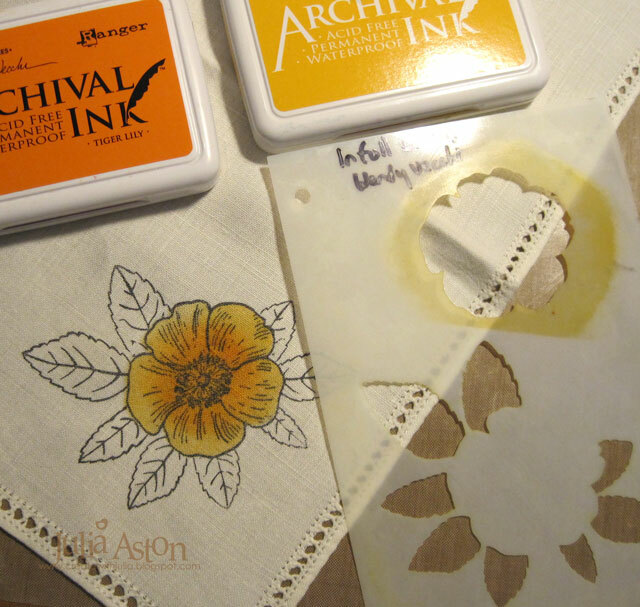 I ironed over the stenciling to heat seal them as suggested by Wendy in her tutorial. 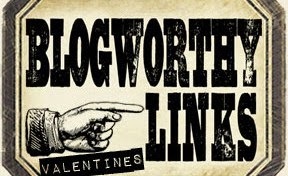 We hope you will join us this month over at A Vintage Journey with your All Squared Up project! 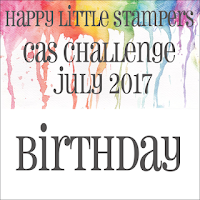 You have until August 3rd to link up your creation. 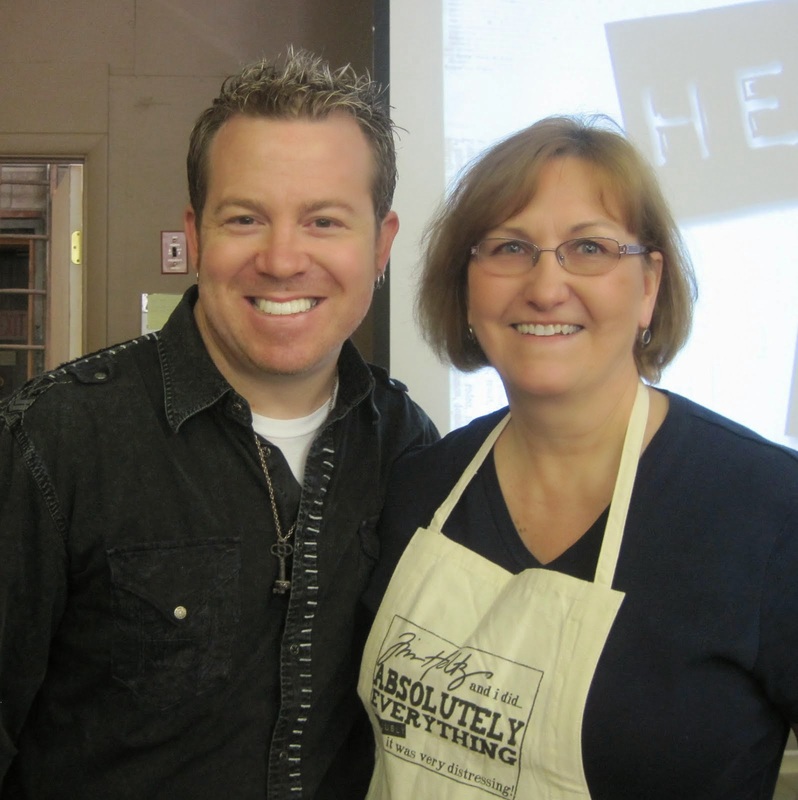 Our sponsor this month is Tando Creative. A randomly chosen entry will win a Tando package of MDF and mini shapes. 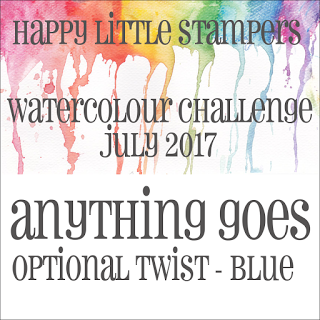 Please check out the challenge and all of the wonderful 'square' inspiration from our awesome Creative Guides! You'll find it all here. 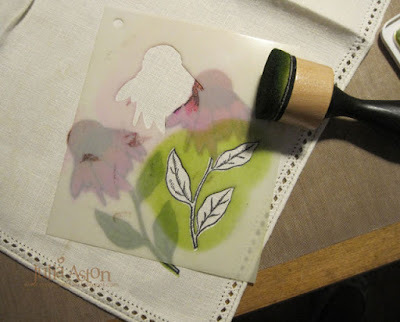 Stamps: bird from Tiny Trees set - Waltzingmouse (retired), Stamp It Stencil it sets - In Full Bloom, Cone Flower and Hydrangea - Wency Vecchi Stampers Anonymous. Ink: Archival Jet Black, Wendy Vecchi Archival Leaf Green, Tree Branch, Sun Flower, Cactus Flower, Watering Can, Tiger Lily, Hydrangea, Red Geranium. Accessories: Linen Napkins, Blue Painters Tape, stencils - From the Garden, Check Mate, Layered Tree, Sentiments - Wendy Vecchi Studio 490, iron.